M R Gardens' Pre-Season Prep plant list and order form are now available! I anticipate that Vates kale, Champion collards, Brussels sprouts and Bilko Chinese cabbage will be ready for pickup by April 1, depending on weather. 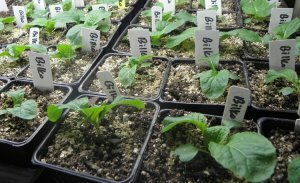 Summer crop transplants, which I expect to be ready by Mother's Day, include heirloom tomato slicers, disease-resistant tomato slicers, cherry tomatoes, plum ("Roma") tomatoes, tomatillos, ground cherries, sweet and hot peppers, eggplant and basil. Click here to view photos of some of the varieties. I'm running a trial of several medicinal herbs, beneficial flowers and native perennials, so as those become available, I'll let you know. Orders for spring and summer crops are due Wednesday, March 18. Request an order form by emailing gardens@wncmretc.com or calling 828.333.4151. To encourage folks to save and scrub their plastic pots, I'm upping the washed recycled pots discount to 50-cents-off each plant for every returned container. Bring all the pots that you have to receive 50 cents off each plant you buy or accumulate credits toward the purchase of next season's plants. Preferred sizes are 3 to 5" square pots or 4 x 1" cell pots, and all sizes of flats to carry the plants. Cleanliness discourages plant disease in the nursery, so I can only accept washed pots. Thanks for decreasing the amount of plastic added to the landfill! "I felt so great when I woke up on Monday. I really do think it's because I ate so much healthy food at your house! But I started thinking about it and I was like, well, my diet is generally not that horrible. I could do better about not eating frozen dinners at lunch but I do I try to add in veggies and then I usually eat two veggies with some protein for dinner. I think it might have something to do with the quality of the food from your garden. What do you think? This could be the topic for an article! Other than growing my own vegetables, which I don't currently see happening right now with our little plot of shady, wet earth, what do you recommend for getting higher quality vegetables? I'm not even sure that buying at the farmer's market really changes anything. Definitely eating organic, which we generally do. Any other suggestions? Any vitamins/minerals you could recommend? I decided to take Christine up on her idea to write about this subject mainly because her words are so similar to what I hear from other visitors. Friends who have a far less healthy diet than Christine and are hesitant to try unfamiliar vegetables are amazed how good my food tastes. They also tell me how well they sleep at my house and how revived they feel after visits. So I've developed several theories about why their bodies respond so favorably. I'm a fairly simple cook. So when visitors rave about the taste of my dishes, I assume they are actually complimenting my gardening talent rather than my cooking skills. Moreover, they are reacting to the taste of fresh produce straight out of the garden. I usually harvest my vegetables just before I start cooking (or even while I'm cooking). Often people assume they don't like a particular vegetable, but then they eat that same vegetable freshly picked and garden-grown and their opinion entirely changes. I've discussed in previous articles some reasons for the abundant flavor of garden fare. But why would Christine and others feel better after eating my food for a weekend? One theory is that garden fare tends to have more nutrients than store-bought vegetables grown on a large scale. It has been shown that the nutrient content of food today is much lower than it was 50-plus years ago. An often-cited 2004 University of Texas study, headed by biochemist Donald Davis, Ph.D., analyzed 43 common fruits and vegetables and found that six out of 13 nutrients showed declines between 1950 and 1999. A hypothesis for why modern-day vegetables have fewer nutrients is their altered genetics. As varieties are continually bred and selected for traits desirable for mass production, they lose some of the nutritional content that is in older heirloom varieties. We are more likely to grow these heirlooms in our home gardens. I would also add: it's easier to gain a higher nutrient content in the home garden if we use sustainable gardening techniques. My style of Microbe Rich ("M R") no-till gardening encourages a healthy soil ecosystem with a large population of beneficial microorganisms. These break down the abundant mineral content in the red Appalachian clay into a form that the plants can uptake. Those minerals help the plants grow healthy and feed the fruits, which then feed our bodies. Now, I've never run scientific tests to compare the nutrient level of my vegetables to store-bought, but I consistently recognize a difference in their energetics. In late winter, after I've given up on growing greens under plastic tunnels and started supplementing my diet with produce from the grocery, I can tell the difference in my energy. I start craving my own fresh vegetables. As soon as my garden picks up in spring, I feel more like myself. Which brings me to another theory to why Christine experienced a lift after eating my food—she was benefiting from the energetics of gardening and from the essence of the plants themselves. I'm usually hesitant to write about such topics because I don't want to turn away left-brained thinkers who might raise an eyebrow at the idea of "plant energy." Besides, as soon as I declare a theory that seems specifically true to me as true for everyone, life events remind me that there are infinite ways of experiencing the world. Almost guaranteed, as soon as I publish this, life will present to me an alternative theory. However, a class that I'm taking at the Appalachian School of Holistic Herbalism, "Energetic and Esoteric Herbalism," is helping me gain confidence in sharing bits of inner wisdom, which may not be so easily proven. So here goes: I agree with herbalists who say we are affected by the essence of plants just by being around them. We don't have to ingest them to benefit from them. And I'll go a step further and say the energy we give to the plants while growing them affects the food itself. It's occurred to me that our ancestors did not have to cope with as many stress-related health issues because they gained from the health benefits of physical work outdoors since most of them farmed. I've discussed many times, such as in this 2011 article, the therapeutic benefits of work, but as I gain a deeper knowledge of holistic healthcare, I'm starting to understand the mechanics behind this phenomenon. 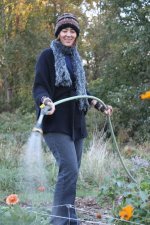 The motion of shoveling, mulching and walking quickly around the garden helps clear the lymphatic system, which is a network of vessels that carry a clear fluid in a one-way direction toward the heart. Lymphatic fluid picks up and transports toxins and infectious organisms, so if its flow is sluggish, our immune function will be impaired. Jumping on a trampoline is one commonly recommended way to increase the lymph flow, but we'll likely feel the same benefits with all the squatting, lifting and moving inherent in garden work. So I've added another reason to my growing list of why I garden: The physical work of gardening encourages the flow of my lymphatic system, essential for healthy immune function. My education is continually expanding! Click here to read about my background in horticulture, sustainable agriculture, experiential education and herbalism. Gain new skills, try out something new, learn about my unique approach to gardening, or just enjoy the physical activity in the outdoors. As we work together, tidbits of information seep into conversation that you otherwise might not think to ask me. In return for your work, you can choose between seedlings, produce, or a tutorial on something in particular you want to learn about. Read more about all the opportunities at M R Gardens.